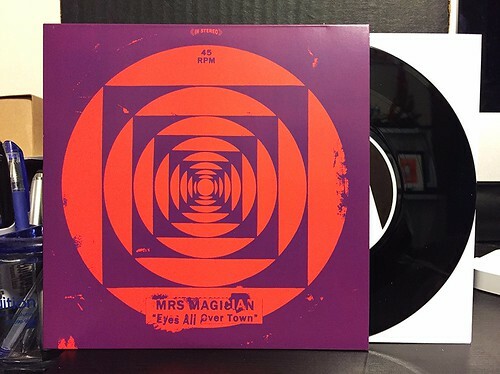 I Buy Way Too Many Records Dot Com: Record Store Day Haul #2: Mrs. Magician - Eyes All Over Town 7"
Record Store Day Haul #2: Mrs. Magician - Eyes All Over Town 7"
When this Mrs. Magician 7" was announced for Record Store Day, it instantly became the record I was most concerned about tracking down. If you've been reading this website for any length of time, you're probably aware that Mrs. Magician put out just about my favorite record of the last ten years with Strange Heaven. I couldn't even possibly count the number of times I've listened to that. The fact that they are finally following it up with a new full length in a few weeks is such great news. I preordered that one a while ago and now I'm just waiting. In the mean time, Mrs' Magician released this 7" for Record Store Day. This was another record that my local stores just weren't carrying for whatever reason. Luckily, the website Interpunk was selling it online and had advertised it as a preorder a few weeks earlier. I wasn't positive it would actually show up, but I decided to take a chance anyway and order this along with the other Swami Record Store Day items. When I finally got that shipping notification I was very relieved that I wouldn't have to go crazy trying to track this thing down. The A side "Eyes All Over Town" will be on the next full length. I'm purposefully trying to avoid listening to any of the preview songs of the record until I can just sit down and listen to the whole thing. I'll write this song up when I review the full length, though I've put a link to the song below if you want to check it out. The B side "I'm Glad You're Dead" is exclusive to this 7". It's another hit for Mrs. Magician. The production of the guitars is slightly cleaner than on past releases, but it only heightens the greatness of their start stop riffs and breezy surf tinged rhythms. The vocals have a nice little layer of fuzz on them and the band has not lost any of their dark wit and humor. It's been way too long since the last Mrs. Magician album. If this 7" is anything to go by, I'm probably going to be pretty happy with the next album. It's only two weeks away. I hope it goes quick.